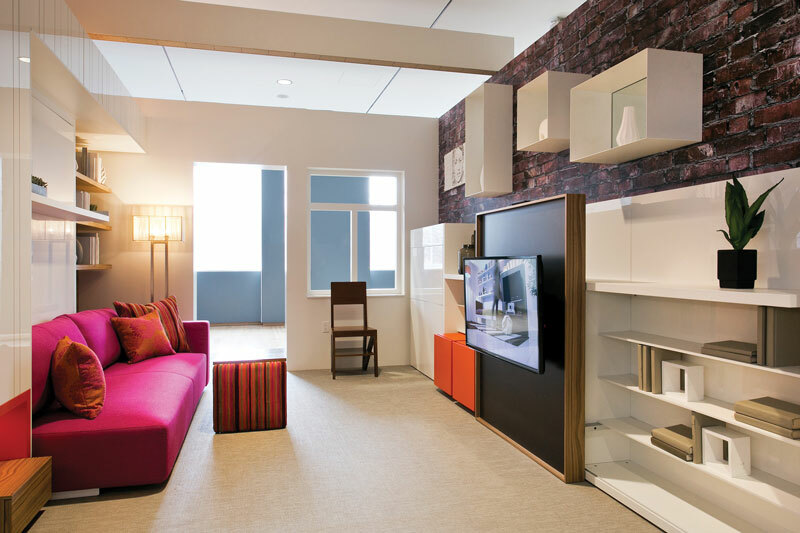 Micro Unit living space featured in Making Room at the Museum of the City of New York. Courtesy of the Museum of the City of New York. The Museum partnered with Resource Furniture, Clei, and architect Pierluigi Colombo to present The Open House, a fully rendered 1,000-square-foot home installed directly in the Making Room exhibition galleries. The Open House will allow visitors to experience how smart, flexible, and efficient design can make a small space seem larger. Many of the novel features and concepts incorporated into the house can be found in the case studies explored in Making Room. We spoke with Lisa Blecker from Resource Furniture about The Open House and what she’s most excited to see in the exhibition. NBM Online: Why did Resource Furniture get involved with Making Room? How does the company’s mission align with the exhibition? Lisa Blecker: Resource Furniture is leading the way in the shift towards more efficient, flexible housing. We are firmly committed to sponsoring, mentoring and supporting non-profit organizations and educational institutions and programs that focus on this shift and address the increasingly important issues associated with housing and sustainability. We became connected to Citizens Housing & Planning Council (CHPC) in 2013 when NYC mayor Michael Bloomberg announced the city’s pilot micro-unit project. CHPC was in the early stages of their Making Room exhibition at collaboration with Museum of the City of New York, and they asked us to build a micro-unit for the exhibition. Since then, we have become extremely involved with CHPC and their housing research projects. In fact, I am now on their board of directors. NBM Online: Can you describe how you worked with the Museum to create Making Room’s centerpiece, The Open House? Lisa Blecker: We started working on the design of The Open House more than a year ago, and it was truly a collaborative process. Working with CHPC deputy director Sarah Watson and curator Chrysanthe Broikos, we first developed the household scenarios that we wanted discussed in the overall exhibition. Then we brought in the architect, Pierluigi Colombo, who is one of the owners and the lead designer of the Clei line of wall beds that are distributed by Resource Furniture – so he knows a thing or two about maximizing flexibility. Over the next 9 months, we went back and forth through several iterations until we all felt that the house struck the perfect balance between smaller-scale living, functionality, felxibility, beauty and the wow factor. NBM Online: Do you have a favorite item or room in The Open House? Is there a particular scenario your excited to see? Lisa Blecker: My favorite space is the main living area that we call Space A and Space B. These two areas can be used as one large living space or, with the push of a button, divided into two acoustically-sound spaces by closing the motorized partition wall system from Hufcor. It’s totally cool. NBM Online: To what extent do you think Making Room and The Open House reflect broader space-saving furniture trends today? Lisa Blecker: There is definitely a trend towards more efficient use of space, whether the space be large or small. Our clients don’t all live in micro apartments. Many of them have large, 3-4 bedroom homes, but they still need more functionality than they currently have. So there are many reasons behind this trend: some people want to live a more sustainable lifestyle, some people are trying to avoid the costs and time spent building, furnishing and maintaining a larger home, some people want to live in a specific neighborhood, and a smaller footprint home might be their only option in a high-priced area. Whatever the reasons, we have found that our clients have generally spent a lot of time educating themselves about their options. Because no one wants to sacrifice comfort or functionality – and with our products, they don’t have to – even in a smaller footprint space. NBM Online: What is the main principle and inspiration behind Resource Furniture’s design? Lisa Blecker: Form and function without sacrificing comfort or beauty. NBM Online: How can people understand multifunctional spaces? What’s easy about them, and what are some of the challenges that come up when designing these spaces? Lisa Blecker: The most important thing is that people need to be able to see a multifunctional space in person and experience it for themselves. That is why this exhibition is so exciting. I know that some may come to the exhibition with some skepticism, but when they walk in to the space and actually experience it, there is almost always an “Aha” moment that makes me smile. NBM Online: Resource Furniture was named “the biggest retailer in the multifunctional space in the U.S.” by The Wall Street Journal. Have you seen increased interest in multifunctional spaces since the company opened? Why do you think that is? Lisa Blecker: Yes – tremendous double-digit growth every year since 2007. And the reasons are as varied as our clients as I mentioned earlier – but the bottom line is that many Americans are thinking a lot more critically about how much space they actually need as opposed to want. NBM Online: What have you learned from developing this exhibition with the Museum that you’ll take back to your work at Resource Furniture? Lisa Blecker: Oh so many things! First, it was so exciting to discover all the amazing products that are showcased in The Open House. I have plans to use more than one of them in my own home! But mostly I think everyone who experiences the home will take something positive away with them – and that is very rewarding. Learn more about Making Room: Housing for a Changing America, opening November 18.